Botswana is a country in Southern Africa with endless possibilities when it comes to landscape, wildlife and nature. For good reason, Botswana was named by Lonely Planet as the top travel destination in 2016. Having a great range of scenery and being home to both desert and delta, makes travel to Botswana to be put on anyone’s bucket list. I can only agree with Botswana being a must see travel destination. Having visited multiple times, in various seasons as well as over a few years, I must say that Botswana has undergone some interesting changes in a positive way. As an introduction to the country, here are some interesting facts that provide some great inside information to any future visitor. 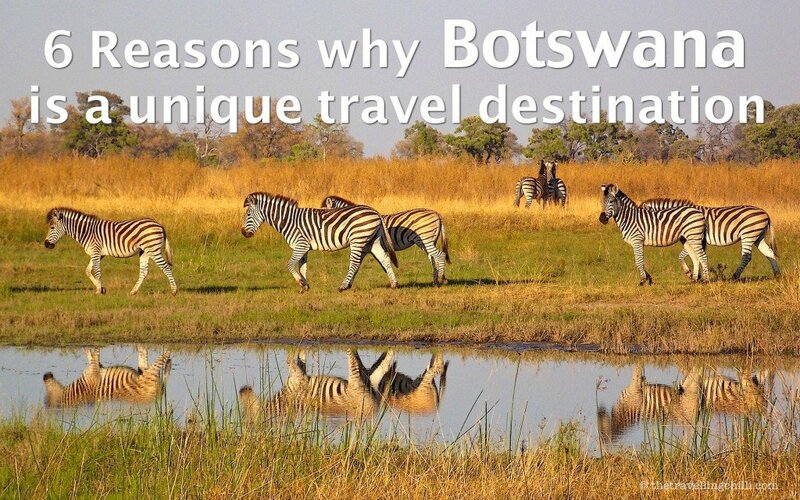 From an insider’s point of view, I have listed various reasons why travelling to Botswana should definitely be on for the coming years. Botswana is home to a wide range of national parks and game viewing reserves. The uniqueness comes from the uncommon combination of desert and delta, giving the different parks each an unparalleled appearance. Almost all offer excellent wildlife viewing possiblities, each with their own highlights. 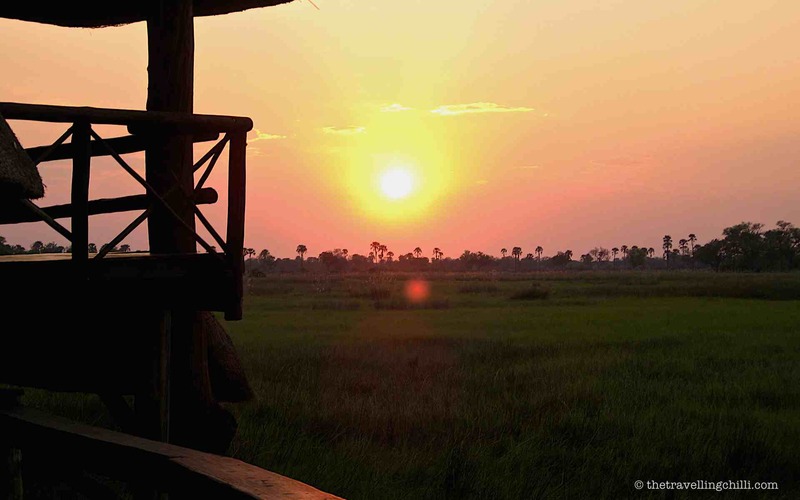 Okavango Delta: Listed as Unesco’s 1000th World Heritage Site, it’s one of the largest inland deltas in the world. 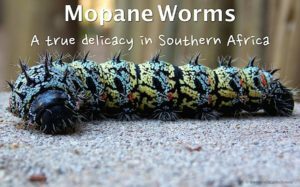 It’s a very diverse ecosystem that attracts many animals to live in this unspoilt wilderness area, including the Big Five. Bird lovers will be spoilt during the rainy season when many migratory birds join the resident ones in the delta. 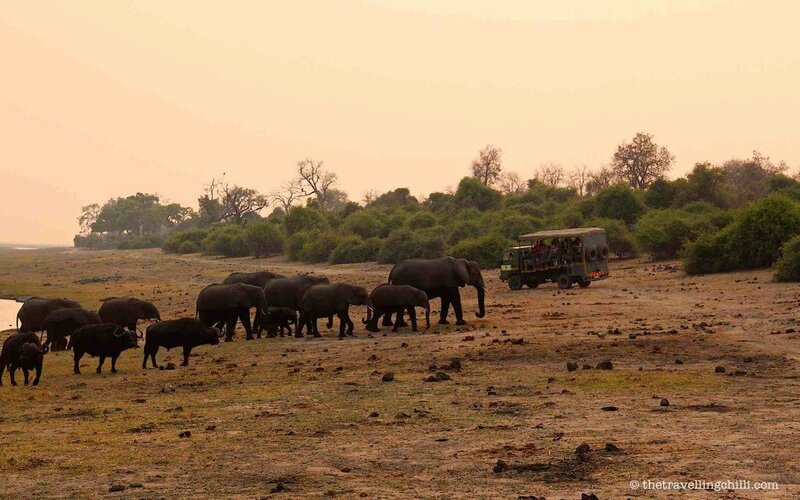 Chobe NP: This park is most famous for the Chobe riverfront attracting large herds of elephants during dry season. It’s also a Big 5 park. Kgalagadi Transfrontier NP: Set up in collaboration with South Africa, it is the first transfrontier peace park in Africa. 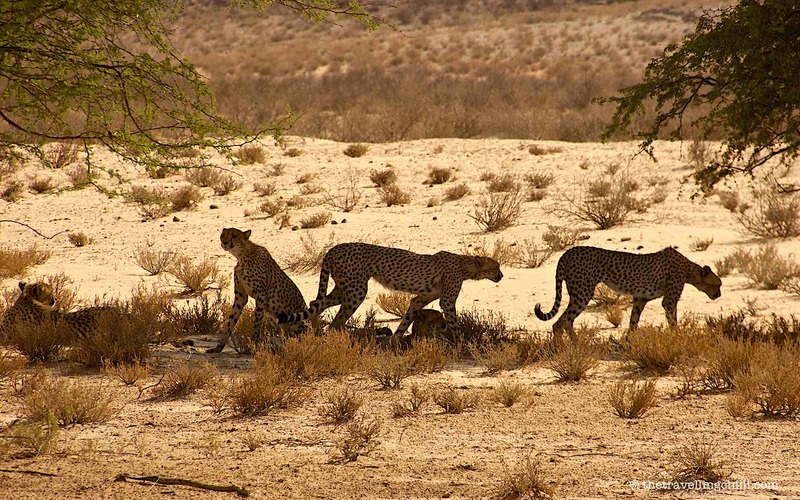 It mainly consists out of dry riverbeds and the Kalahari desert and attracts a whole wide range of predators, making it a perfect area for viewing wild cats. Makgadigadi Pans: It’s one of the largest salt pan areas in the world. Famous for hundreds of thousands of flamingoes that arrive during the floods. Other parks that are worth mentioning are Khama Rhino Sanctuary, Moremi Game Reserve, Thuli Block and Central Kalahari Game reserve. More detailed information via Botswana Tourism. The large diversity of national parks each attract different concentrations of wildlife. Basically most of the wildlife of Southern Africa can be seen in Botswana. 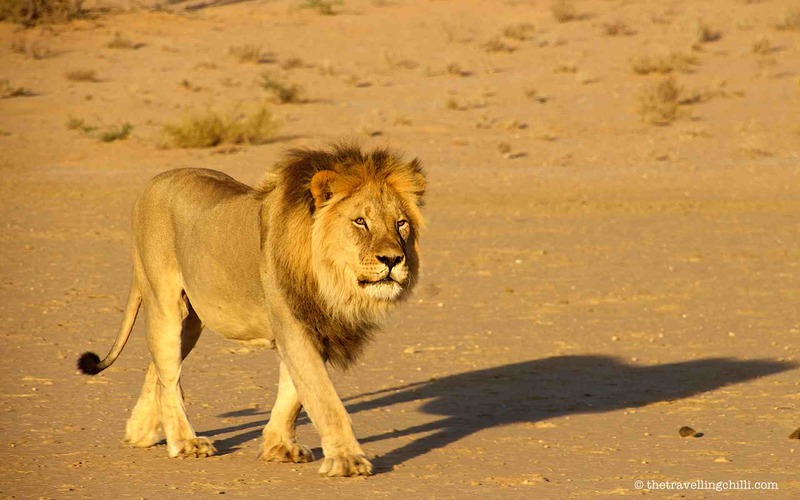 The Kgalagadi Transfrontier park is most famous for spotting large predators and more unique sightings such as the brown hyena and the African wild cat. Chobe National Park hosts the largest concentration of elephants anywhere in Africa. When taking a boat cruise down the Chobe River during dry season it is not uncommon to spot hundreds of elephants along the riverfront, as well as crocodiles, hippos and buffalos. Wild dogs are also very commonly spotted in the Okavango delta and Moremi game reserve. Botswana is a country where possibilities seem endless. 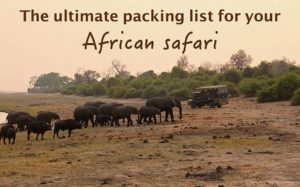 Most people have either seen or been on safaris where a safari guide drives you in a 4X4 open vehicle through the African bush to spot wildlife. This is also the most common way for any safari. In most of the parks selfdriving safaris are possible as long as you have the appropriate vehicle (normally 4X4 and high clearance). In most national parks you are not allowed to go in with a normal 2X4 vehicle, mainly due to the road conditions such as sand, mud and rivers that need to be crossed. However, there are some other great ways to enjoy wildlife. 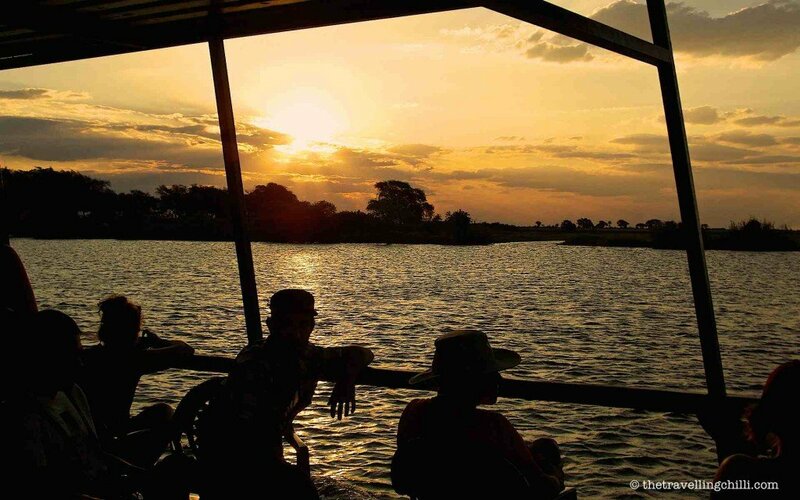 The most popular way to visit Chobe NP is by boat on a river cruise. The boat allows you to get a much closer look at the wildlife that lives in and around the water, like crocodiles, hippos, buffalos and waterbirds. During dry season the riverbed also attracts many other animals that come to drink. Being on a boat, sipping a tasty cocktail under a setting sun and obversing the animals that come for an evening drink is just like paradise. Also in the Okavango Delta, motor boats are used to cross the small meandering channels that crisscross the area. 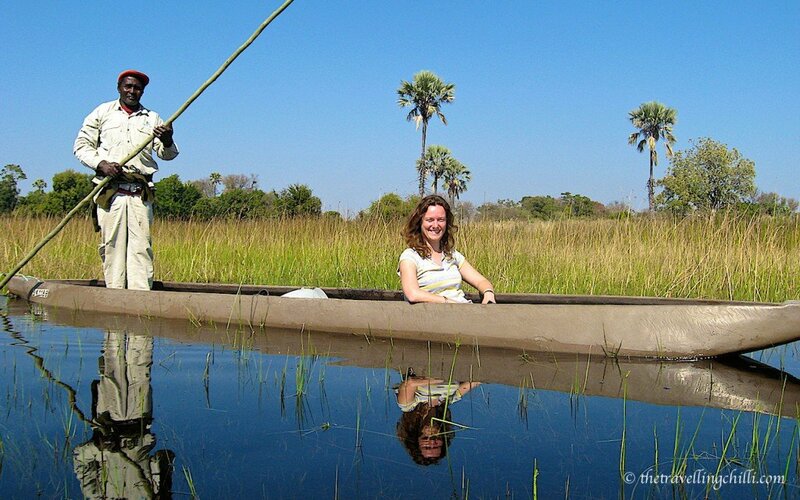 A mokoro is a traditional dug out canoe used as a primary means of transport in the Okavango delta. It allows for anyone to use the shallow reeds and papyrus fringed waterways that meander through the islands which are impassible by motor boat. It’s also a perfect way to soak up the sounds of nature while the mokoro cuts slowly and quietly through the water. A mokoro is handled by a poler using a long stick to push the boat, comparable with a gondola in Venice. 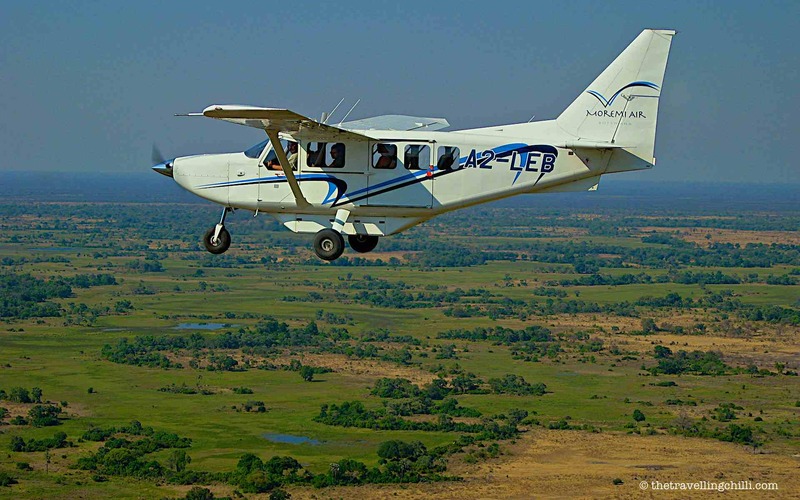 Flying is another way to discover the huge area of the Okavango Delta, either by plane or by helicopter. It’s more to discover the Delta itself, but at the same time you can spot wildlife from a completely different perspective. By plane you will only be able to see the larger mammals like elephants and giraffes (unless the pilot decides to dive down to come closer to the ground when he sees something…been there done that…horrible for your stomach…). When flying over by helicopter, you are much closer to the ground and being able to hover, you should see most other animals as well. 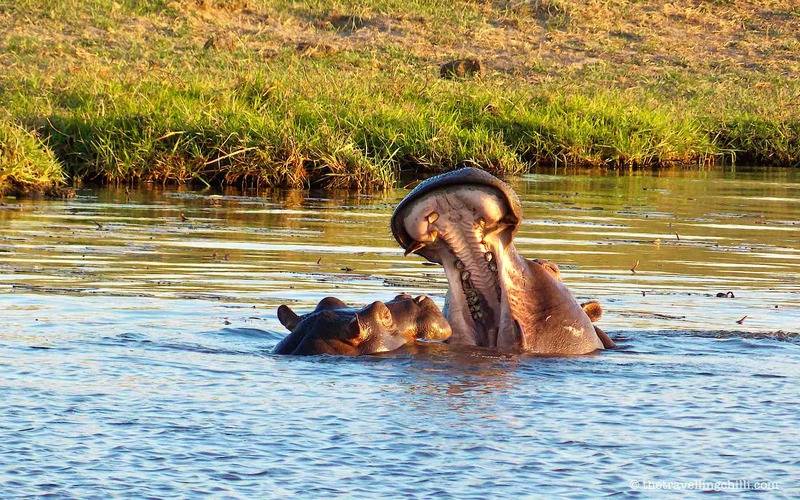 You can even see the hippos sitting in the water, while on land you can only see their ears and nostrils. So funny. 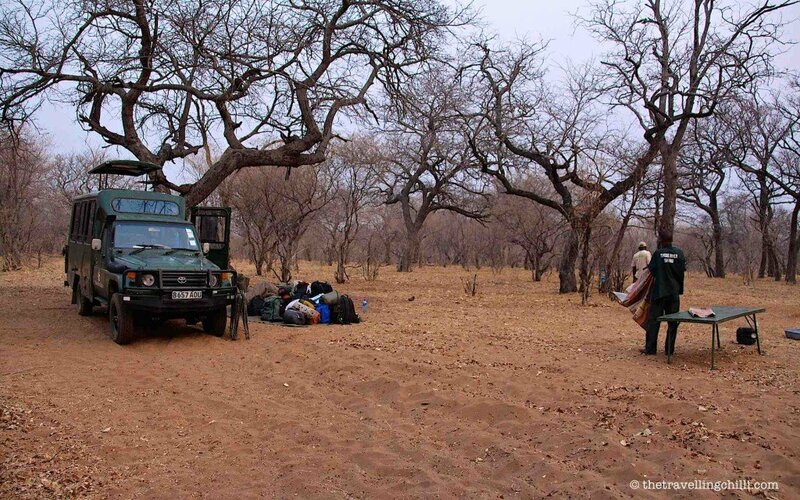 Some national parks allow you to go on foot, with an experienced armed with a rifle safari guide, of course. The advantage is that you are in the middle of nature, not protected by anything else other than yourself (and your small group and guide with gun, used to scare animals away, if necessary). It’s such a thrilling experience to walk in the middle of a game viewing reserve knowing there are dangerous animals around. You will not be able to get as close to an animal as with a car or a boat, since most animals will flee when they pick up your human smell. But just looking at them in the wild is one of the most amazing things to do on a safari. And anyway, you really don’t want to get too close to a lion or a leopard, your guide will make sure of this. 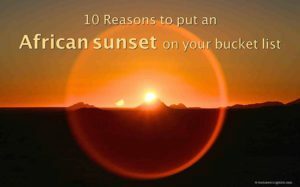 In a lot of places around the world, the most stunning sunsets and sunrises can be seen. What makes travel in Botswana so unique is that the country is flat and so the sun rises and goes down with that perfect golden and orange glow. The peacefulness and quietness of the country, the sounds of animals in the distance and up close, the variety of nature and hardly any other people around while enjoying the golden glow of the sunset, priceless. For everything else, there’s your Mastercard, or Visa. Botswana’s tourism policy is generally based on ‘high price, low impact’. Basically Botswana likes to attract tourists who are willing to pay a higher price for a unique and exclusive experience. This does not mean that it’s only all about staying in a luxury lodge while sipping champagne and admiring the sunset. It’s also about the general experience. The lodges and campsites are small scale and will accommodate less visitors than your typical All-In European / Mediterranean resort. 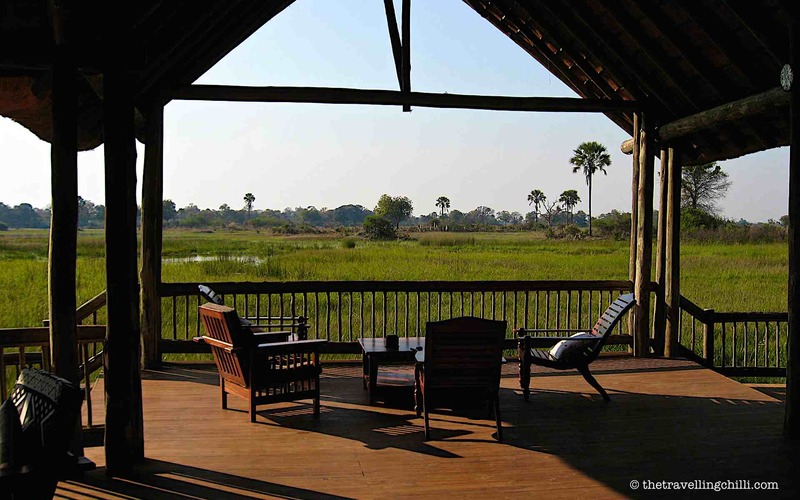 Some of the lodges in the Okavango Delta are only reachable by flying in with a small plane and in this case, the remoteness comes with a price, obviously. This does not mean that you need lot’s of money. It just means that there won’t be large amounts of tourists in the same place at once. None of the type of people who are just visiting the country for an extra stamp in their passport, but just the ones who love to discover the country and the beauty it has to offer. Almost all possibilities are possible. Either you can stay in a luxury lodge, in budget accommodation or even camping. When staying over in some of the national parks, your wildlife experience will be one of a kind. Most of the accommodations stay true with nature and are unfenced. This means that wildlife will walk through the camp, especially at night. And this is the case as well with the luxury lodges as with the standard campsites. 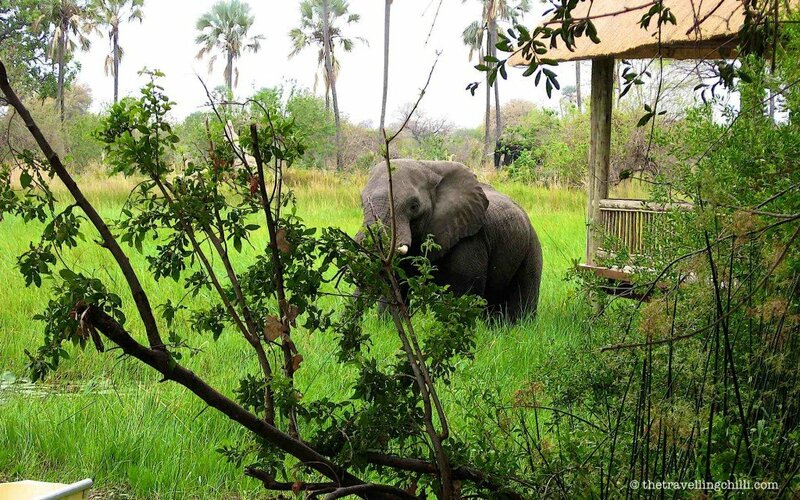 The whole purpose is that animals are free to go wherever they like to go and if an elephant decides to eat the juicy fruits from the tree next to your safari tent, he is allowed to do so. There are rangers around the unfenced camps who will keep track of this and are there for your safety. It’s an amazing and unmatched wildlife experience. Who can say they took a shower with an elephant just standing a few metres away munching on a tasty fruit. Will Botswana be your future ‘unique travel destination’? If you have visited Botswana before, did you enjoy your trip? Mokoro looks luuurvely. As do all your safari photos – very inspiring. I’ve been to Kenya for a safari but would love to venture deeper and discover Tanzania and Botswana too. How relatively affordable is Botswana. I am inspired! I haven’t been on a safari. I think it’d be one of those things that would just take your breath away. Would you agree? 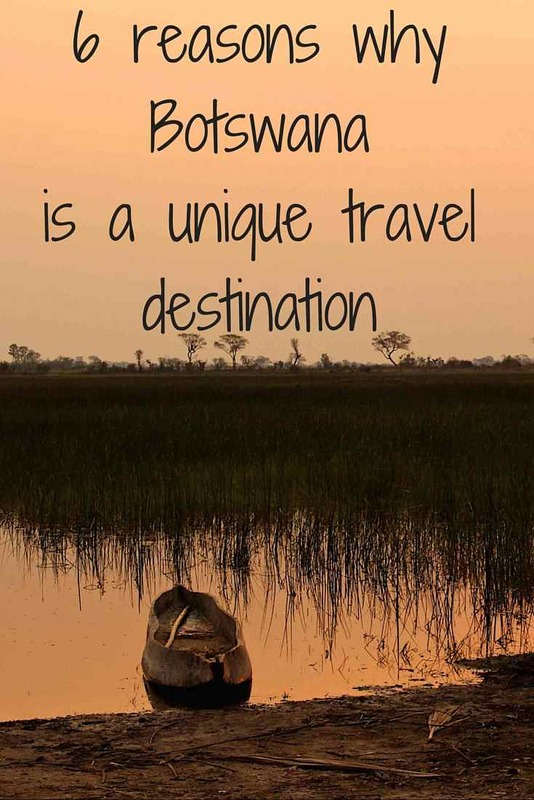 Great post, that’s why Botswana is a top destination for 2016! Wow! What an amazing place. When I first saw the delta on the Planet Earth series I fell in love, and now reading this I’m more excited to go there someday. Great call out about the fenceless experience. It sounds like none other and I’d love to do the camp version. I’ve done both, luxury accommodation and bush camping. 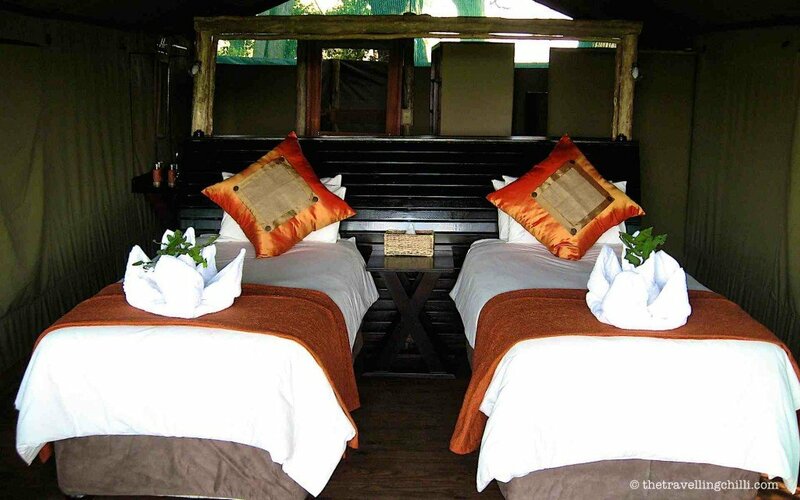 And even though the luxury safari tents are really cool and nice, I kind of prefer the bushcamp. You feel really close to nature, and at any stage an animal can walk into your camp. Very exciting!! Wow, what an amazing trip that must have been! When I saw your first photo, I thought it surely must be “courtesy of” and was surprised it was taken by you. And by the photo of the elephant “visiting” I was in awe. I so wish I could go there! Thank you for sharing your story and the fantastic photos! The nature reserves and safaris of Botswana look amazing! Did you visit anywhere else in the country or just the nature reserves? I’ve been to a few other places like Maun, Kasane, Palapye, Nata,…but these were mainly stopovers to get to the nature reserves, of stopovers to break up a longer trip. 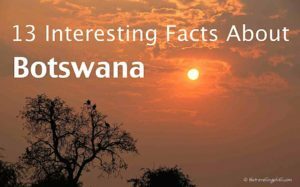 Botswana is mostly about nature and the towns surrounding them. I’ve really visited Gaborone and Francistown (just passing through), but it might be worth a stop as well. Wonderful post, I could feel I was in Botswana and could hear the roar of lions and the trumpeting of elephants! It is indeed a wildlife paradise, a dream destination. Hope my dream turns into reality some day 🙂 Great photos too! 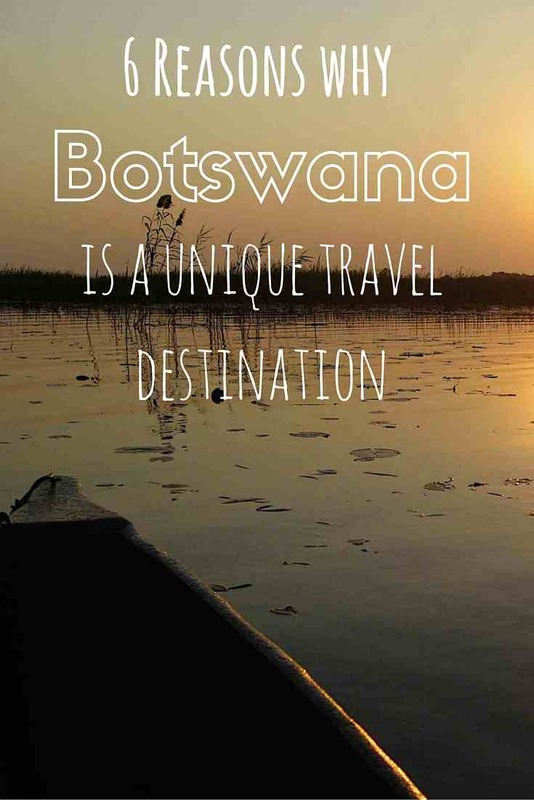 Absolutely, Botswana will be my future unique travel destination! Never really thought about Botswana like that, but now I will. I would like to experience the peacefulness, sounds of wild animals, and variety of nature, as you mentioned. Great post. I think it would be incredibly interesting to do a safari on foot. Another place to add to my bucket list! Botswana is definitely a place on my bucket list. I’ve been to Tanzania, Uganda and Zambia – do you know how it compares to those? They’re all great destinations of course, and your photos here certainly make visiting there a tantalising prospect! Your photos…wow, just wow! I used to never really give much thought to the idea of going on a safari, but lately it’s beginning to seem like a great idea! I wish I could take credit for these photo’s, but I can’t as they are all Sabine 🙂 We really are both thrilled that they (the photos) have inspired you to hopefully take that trip of a lifetime! 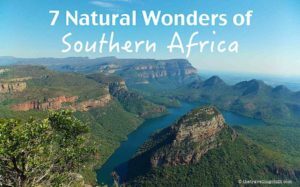 I never knew South Africa had so much to offer! Thanks for sharing this! I can’t believe I’ve never been to Africa before! This looks so beautiful and such a great experience! You have captured some truly wonderful images there. Makes me so nostalgic for Africa although I never made my way to Botswana. Hope to change that soon after reading this wonderful post! Thanks a lot! One can take amazing photos in Africa, in this wonderful continent. Glad I could convince you with this post! Botswana look AMAZING! I haven’t been to Africa (yet! ), but when I do go, it will be high on the list of places to visit. 🙂 Gorgeous pictures! Botswana really is an unbelievably unique experience, my favourite from the above is definitely the Okavango mokoro trip; I have taken this quite a few times while working down there and some insane experiences can come about from camping in the bush overnight…what a wild encounter!! As you mentioned above, I also just love the fact that the parks are unfenced too, it adds so much more excitement to a trip to Africa ! Indeed Derek, the unfenced parks and camps give an extra thrill to your stay there 🙂 Where have you worked in Botswana? You had me at wildcats of Africa and walking safaris! Before I went to Tanzania I thought I’d never go back to another part of Africa, done that I figured. Now after Tanzania I would love to go back and see all of Africa- so many differences in each area. All are beautiful! Such an awesome place!???? will definitely visited it again. What an amazing experience! Your photos are really beautiful too. 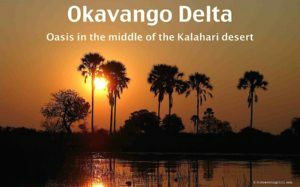 I’d love to visit the Okavango Delta one day. Botswana is my favorite country in Africa! I love it. Chobe was magical. I loved riding in a boat for a safari. I never knew that was even possible. The wildlife is amazing. BTW: I love your opening photo of the zebras and their reflection…stunning! Well said Sabine, Botswana is like the Last Eden. This is where I was born and bred. But please guys, drive carefully around main tarred roads. As you said Sabine some roads are not fenced at all to allow free animal movements. Animals have ran into roads and collided with vehicles. My next destination is Khawa for the annual Dune Challenge. 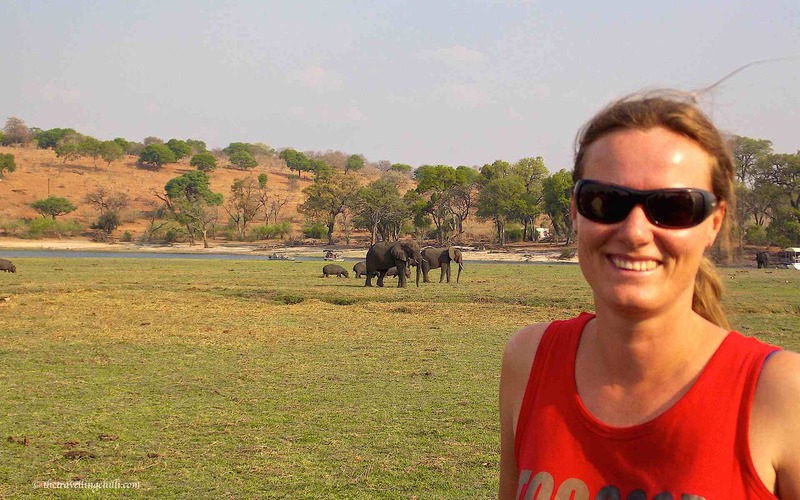 Have you been to the Moremi Gorges, and the Khama Rhino Sanctuary? The Rhino Sanctuary is doing a good job, oh and Cheetah Conservation in the Mmokolodi Nature Reserve. The rhinos are increasing in numbers from near extinction a couple of decades ago. Sabine you are right, the country has diverse natural sights. One has to just come and see what you are talking about. I was in the Okavango last year and just loved the animal sounds at night. That picture of an Elephant popping in for a visit was my experience too. You can check me facebook. Wow I’m really impressed by your photos…beautiful! What lens did you have ? I’m going to botswana and south Africa in April and I want to be sure to take the right lens ???? your article really makes me think I made a good choice, Botswana seems awesome! I’ve been dying to go to Botswana for years. It looks like such a diversely beautiful country! Every time I visit Botswana I am amazed about the beauty the country has to offer. The variation is incredible for a country that is actually located in the desert. You will love it! Great post. Although I live in South Africa, Botswana’s neighbour, I have only been to Gaborone, it’s capital. But I really want to visit the Okavango Delta and Chobe as I am a safari junkie. Would go here and now if I had an opportunity. Seeing all these animals there – precious!